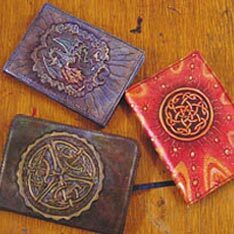 Located at the Old Butter Factory in Bellingen, NSW, Awl Leather has been making and selling leather goods since 1991. 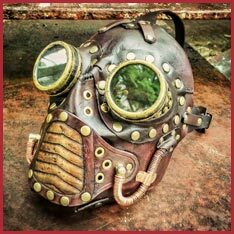 Our range includes leather sandals, handmade footwear, moccasins, medieval shoes, leather art, bags, belts, wallets, travel goods, steampunk masks, medieval leathercraft items, holsters and whips. 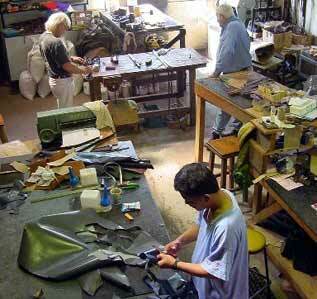 Saddlery and other horse gear are also routinely made and repaired. Awl Leather has built a far ranging reputation for its sturdy, carefully crafted footwear and leather accessories with customers across the country and overseas. Awl Leather presents work by Bruce Erskine, Anton Halim, Chub McNeil, Gabrielle Tindall and Alex Cowley. International orders are welcome and can be placed via the website. Freight prices for overseas orders will be quoted via email prior to shipping. All prices on this website are in Australian dollars. 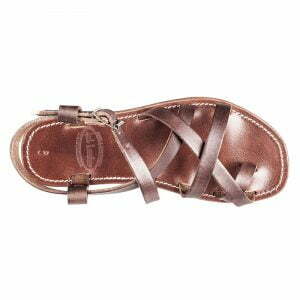 Australian handmade leather sandals. 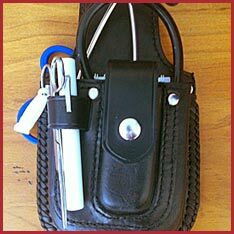 Slip-on design with multi cross strapping and toe loop. Colour: Brown. Sizes: 3-12 (see sizing chart). Materials: Cowhide leather straps, leather topsole and EVA bottomsole. 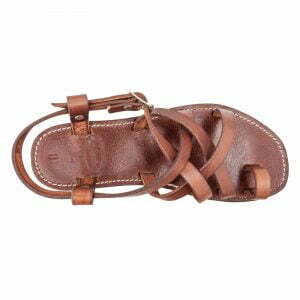 Australian handmade leather sandals. 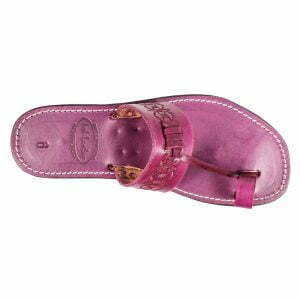 Slip-on design with hand tooled strap and toe loop. Colour: Brown, Whisky, Burgundy, Black. Sizes: 3-12 (see sizing chart). Materials: Cowhide leather straps, leather topsole and EVA bottomsole. 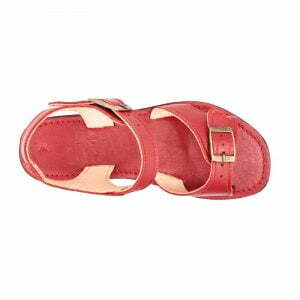 Australian handmade leather sandals with cross strap design, heel strap and buckle closure. Colour: Brown. Sizes: 3-12 (see sizing chart). Materials: Cowhide leather straps, leather topsole and EVA bottomsole. 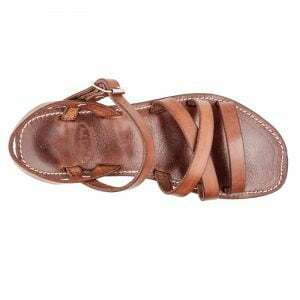 Australian handmade leather sandals. 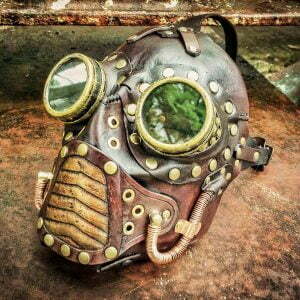 Leather straps with leather lining. Adjustable toe strap and heel strap with buckle closures. Colour: Brown, Black, Red, Purple, Orange, Lime. Sizes: 3-12 (see sizing chart). Materials: Cowhide leather straps, leather topsole and EVA bottomsole. 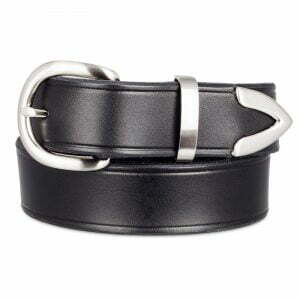 Australian handmade 32mm solid cowhide belt with nickel buckle and tip. Colour: Tan, Black, Brown, Mahogany with brushed nickel buckle and nickel tip. Sizes (inches): 30, 32, 34, 36, 38, 40, 42, 44, 46. Materials: Cowhide leather. 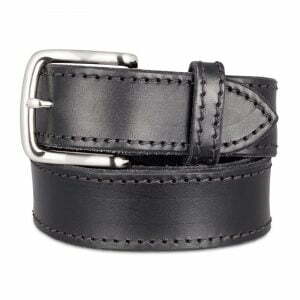 Australian handmade 40mm solid cowhide belt with nickel buckle and stitched border. 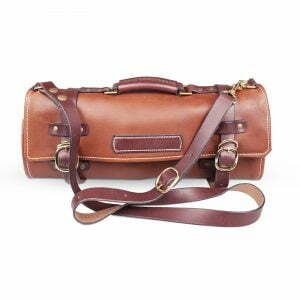 Colour: Tan, Black, Brown, Mahogany with nickel buckle. 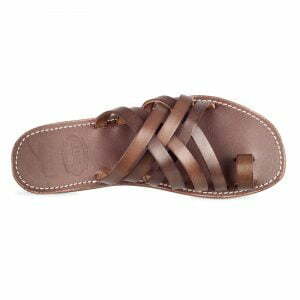 Sizes (inches): 30, 32, 34, 36, 38, 40, 42, 44, 46. Materials: Cowhide leather. 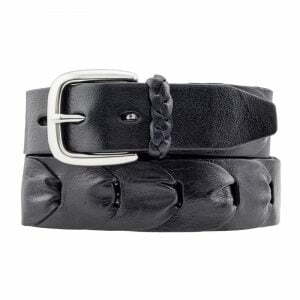 Australian handmade 32mm solid cowhide belt with brass buckle and decorative stitching pattern. 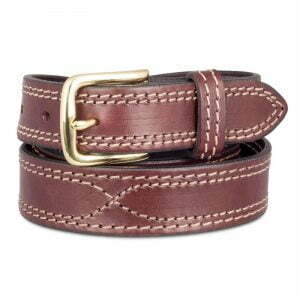 Colour: Tan, Black, Brown, Mahogany with brass buckle. Sizes (inches): 30, 32, 34, 36, 38, 40, 42, 44, 46. Materials: Cowhide leather. 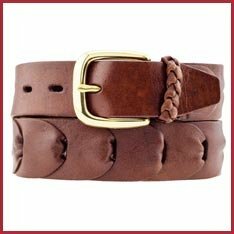 Australian made 32mm Kangaroo leather link belt. Colour: Tan with brass buckle, black with nickel buckle. Sizes (inches): 30, 32, 34, 36, 38, 40, 42, 44, 46. 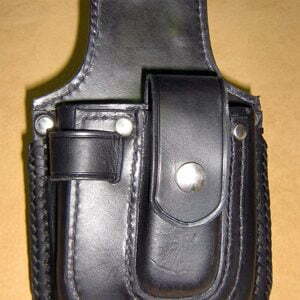 Materials: Kangaroo leather. 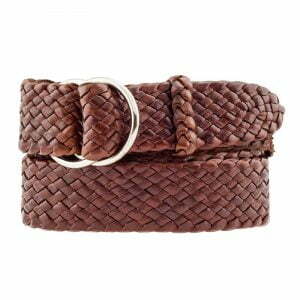 Australian made 30mm plaited Kangaroo leather belt. Colour: Tan with nickel rings, black with nickel rings. Sizes (inches): 30, 32, 34, 36, 38, 40, 42, 44, 46. Materials: Kangaroo leather. 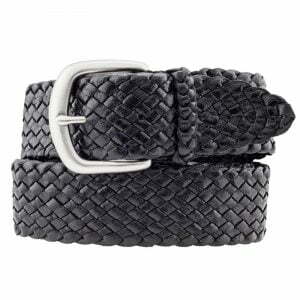 Australian made 32mm plaited Kangaroo leather belt. Colour: Tan with brass buckle, black with brushed nickel buckle. Sizes (inches): 30, 32, 34, 36, 38, 40, 42, 44, 46. Materials: Kangaroo leather. 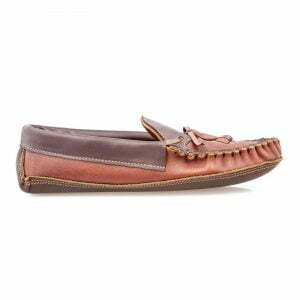 Australian handmade solid cowhide moccasin with leather sole for indoor use. Colour: Tan with dark trim, Black. Sizes: 4-13 (see sizing chart). Materials: Cowhide leather straps, leather topsole and leather bottomsole. 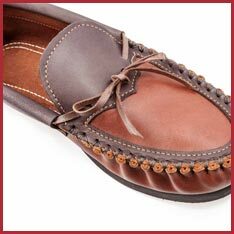 Australian handmade solid cowhide moccasin with flexible EVA sole for durability. Colour: Tan with dark trim, Black. Sizes: 4-13 (see sizing chart). Materials: Cowhide leather straps, leather topsole and EVA bottomsole. © 2018 Awl Leather. Website by Dynamic Web Solutions Pty Ltd.